Recall that in 2014, NIH relaxed its resubmission policy (OD-14-074) to allow applicants to submit a new (A0) application following an unsuccessful resubmission application. Also, we recently posted a piece showing that review outcomes for new applications submitted following an unsuccessful resubmission had about the same funding success as other new applications. But some applicants may wonder, what is the funding success for a resubmission application? The data show higher success rates for applications coming in as a resubmission, but we know there may be other factors that influence whether researchers decide to resubmit an application. To that end we’re launching a survey to understand patterns of resubmission for new investigators. (If you receive an invitation, we hope you will respond and share your input with us!) In addition, today we want to provide all Open Mike readers with information about what to consider if your initial grant application to NIH is not funded. First and foremost, we strongly encourage applicants to make an appointment for a consultation with the assigned program officer (PO). Program officers have a wealth of experience that can inform the next steps for the research proposed in the application. Program officers may be aware of other factors that can offer advantages, like new funding opportunities well suited to the science in the application. The contact information for the PO is at the top of the face page of the summary statement. Most POs prefer that to be contacted them by email to schedule a time for a phone call, giving him/her time to review the summary statement. In the meantime, you can find a great deal of self-help information about the funding priorities of the various NIH institutes and centers, and the funding success rates associated with different types of grant applications by consulting information in the NIH data book. We have updated the Applicant Next Steps web page with more guidance to help applicants locate information on the NIH web sites about funding success, IC strategic plans, and funding policies. For most investigators, achieving funding success usually comes from persistence and patience. The typical applicant who was successful in obtaining funding in the past few years from the NIH has submitted several applications prior to obtaining support for their research. In particular, resubmission applications have a better chance of being funded in comparison to original applications. 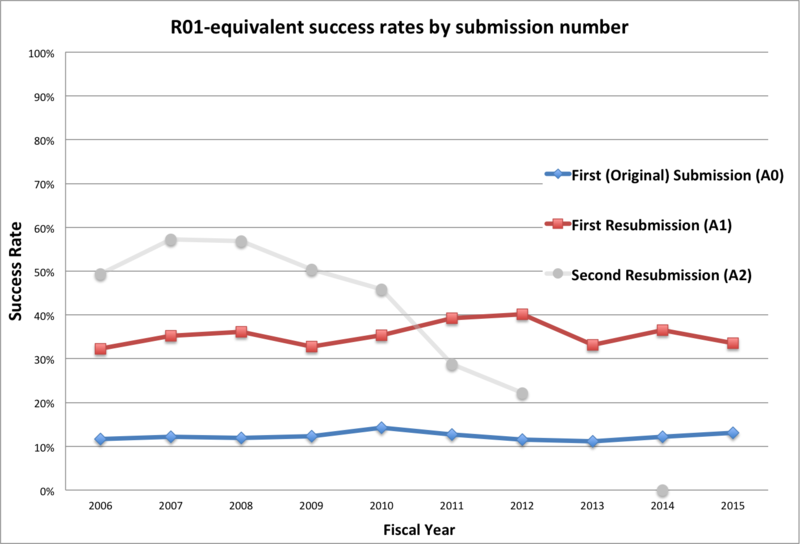 In 2015, the NIH-wide success rate for new R01 applications was 13.1%, whereas the success rate for resubmission applications was 33.5%. It is also important to determine the best application strategy for the specific science, and the scientist, involved in the application. Each Institute and Center (IC) has a unique funding policy that takes into account many factors, such as the New Investigator and/or Early Stage Investigator status of applicants. ICs also consider the balance of short-term (e.g. R21 and R03) versus long-term grant support (R01) within their portfolios. Knowing how the IC prioritizes different activities may influence your choice to submit an R01. It is important for New and Early Stage Investigator to note that these designations are not considered in the review of any investigator-initiated grant activities other than the R01 research grant. We encourage all investigators who have recently learned that their application may have missed the fundable range to review the information provided on the Next Steps webpage. We hope you’ll share this blog with your colleagues and mentees, and that this information proves useful in preparing your next resubmission application. This entry was posted in blog, Open Mike and tagged A0, A1, applications, Early Stage Investigators, Funding data, new investigator, Peer review, resubmission, resubmissions by Mike Lauer. Bookmark the permalink. It would be very useful to have a similar analysis from a representative of NSF. That would be interesting, but NSF does not have an equivalent to the -A1 resubmission format. Every grant application is technically a brand new one, so sorting out the true “revise and resubmits” for statistical analysis would be a more laborious task for NSF. NSF does say that “Principal Investigators submit on average about 2.3 proposals for every award they receive.” (See also the annual Merit Review report to the National Science board at http://www.nsf.gov/nsb/publications/2016/nsb201641.pdf. As others have observed below, a more telling piece of general information would be how the success rate at resubmission covaries with the original impact score/percentile/not discussed status. NIH grant application now becomes an art of application or random lottery. I had a grant scored 22% in the initial submission, was not funded, resubmitted this year by carefully addressing all points raised, and guess what, the % dropped to 54% in the re-review. Getting NIH grants is a nightmare in USA. We waste so much time on writing grants all year around rather than doing science. What a shame! I am so jealous of my colleagues in China who get equivalent of several R01 grant money easily. I agree with the author’s sentiments. The grant writing has become a lottery-ticket buying spree. One doesn’t know which one will bring the dough. Most often it brings heart ache than the succor, the writer hopes for. Since you are investigating, I’ll suggest another line of inquiry. You should look into the traffic holding pattern phenomenon and the bias for revisions. A key part would be asking PIs about whether their resulting science was fundamentally improved by the revision process. After all, the goal here is not to select the best application document, judged by the arcane rules of study sections. The goal is rather to select the best chance at the best resulting science after 4-5 years of funded work. This information is appreciated, but I was hoping for a deeper analysis. Resubmissions tend to be more successful in large part because applicants make a choice to resubmit or cut bait based on the previous summary statement/impact score. I for one would like to know the success rate of resubmitted applications *as a function of* the impact score received on the original in the ‘no A2’ era (preferably broken down pre/post ‘virtual A2’ policy, if sufficient data are available). Thanks. Is there data available to show success rates of scored and unscored grants and whether there is the expected inverse relationship between percentile of the A0 and the success rate of the A1? Seems logical but confirming it with data and would help guide resubmission by evidence istead of conjecture on my part or others. Another useful analysis would be to evaluate the success rate versus the initial submission’s score, e.g., are any revised grants funded that were initially “not discussed”? An issue we have noted in the last few years with SBIR grants is that the primary and secondary reviewers tend to be qualified and make meaningful criticisms and comments, but we have consistently received tertiary reviewers who have little understanding of the drug discovery process and have little expert knowledge about the area of the grant; they make comments and ratings that are completely out of line with the primary and secondary reviewers. When we consider spending time to complete more studies, and more preliminary data etc etc requested by the tertiary reviewers who are not qualified, and won’t be attending the next study session, we have recently decided we have better odds of taking the money spent on such activities to Las Vegas than on resubmitting and obtaining another crackpot reviewer. The extra time and expense spent on submissions do not create better science. Val’s comments are unfortunately pretty accurate, that re-submitting (or just submitting) SBIR applications is as much a waste of time and money as gambling – which is fine for those who have extra time and money to throw away but not for those who don’t…. As an Electrical Engineer I submitted a grant application relating to a new way to both detect and treat of breast cancer tumors with microwave energy, the application was supported by theoretical analysis, computer simulations, and even preliminary measurements. The application was declined for reasons ranging from “expert” reviewers claims that the technique wasn’t physically possible (apparently “measured data” means something different in their world) to assertions that as an EE I didn’t have a medical background and was therefore unqualified to do medical research. Re-submitting the work generated similar rejections (although many reviewers did recognize the validity and potential of the research). On that first application round – while our application was rejected a researcher at a “big” university was awarded a huge grant to study whether or not a woman’s IQ drops after being diagnosed with breast cancer. I discussed the problem with EE professors I know at some “big” universities, all said that they don’t even bother proposing research to NIH because getting a grant without being politically connected somehow is impossible, that applying is just a waste of time. If the NIH wants truly wants to improve the application process and the research that results, it has to accept that you can’t improve things without actually changing anything…..